When she first looked in the microscope and saw the cluster of new, green-tinted cells, University of Oregon doctoral student Jennifer Hampton Hill was astounded. The surprisingly large cluster of cells hinted that she had just tracked down a very special bacterial protein inside the guts of zebrafish. That elusive little protein is special because it appears to help grow more of the cells that release insulin and could one day lead to new treatments for Type 1 diabetes. The new finding is just one more example of how basic research science can result in discoveries with big implications. In people with Type 1 diabetes, an immune reaction destroys the cells in the pancreas that produce insulin. Without insulin, sugar can’t be absorbed from the blood stream and cells starve for energy. By understanding the basic development of such cells, researchers hope one day to stimulate insulin-producing cells to grow in Type 1 patients. Hampton Hill wasn’t thinking about diabetes when she began this research back in the winter of 2013. She was doing what UO researchers do well, asking a novel, yet basic question about science. In this case, she wanted to know if the community of microorganisms, known as a microbiome, residing within bodies of humans and most other animals could somehow influence the development of cells in the pancreas that release insulin, known as beta cells. To begin to answer this question, she turned to the trusty zebrafish, a traditional animal model developed at the UO by pioneering biologist George Streisinger. The zebrafish is now widely appreciated for its ease of visualization, fast development and most importantly its similarity to humans at a basic biological level. By systematically investigating the natural microbial community within the zebrafish gut, Hampton Hill found that certain bacteria could actually influence the development of the incredibly important beta cells. This was a surprising finding that spurred an exhaustive search to uncover the microbial factor responsible for this new phenomenon. 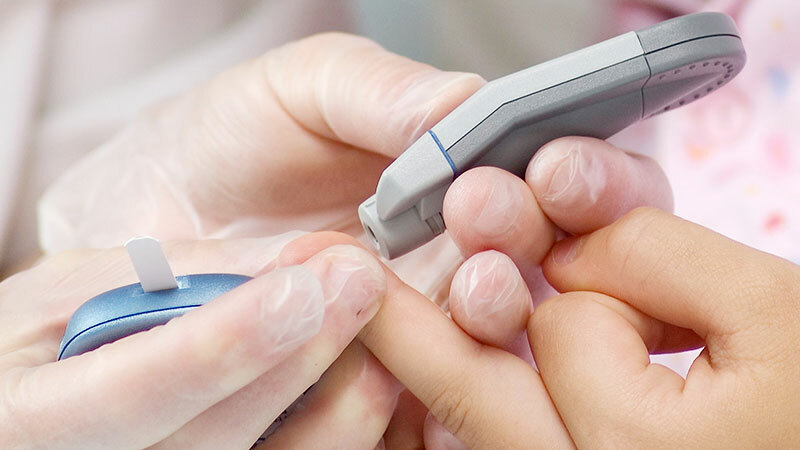 The study sheds new light on associations between the microbiome and development of Type 1 diabetes. 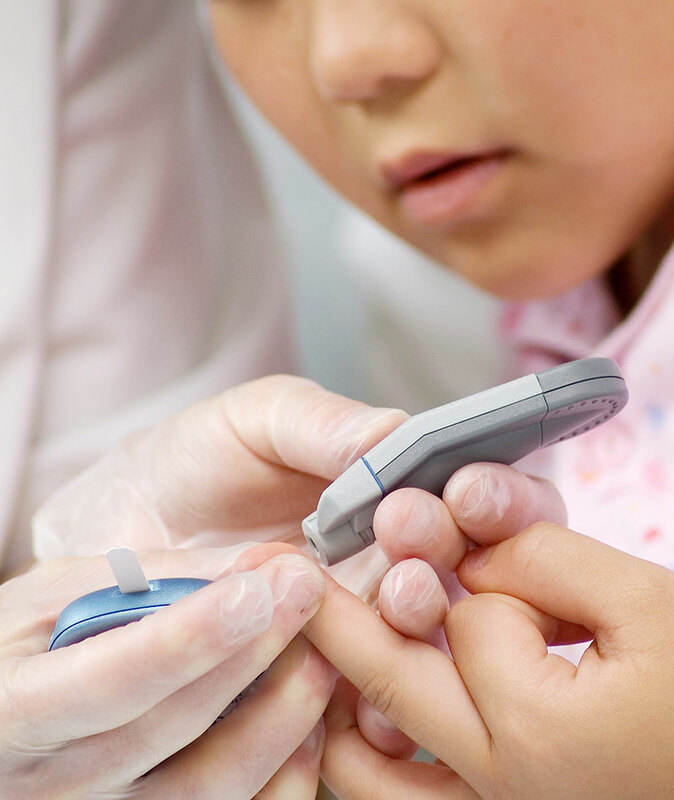 Previous studies have suggested that children who develop Type 1 diabetes tend to have fewer types of bacteria in their microbiomes. Guillemin and Hampton Hill suspect that these low-diversity microbiomes could be less capable of stimulating beta cell expansion early in life, leaving these children with little buffer if their immune systems go on the attack. Immediate implications of the research from the Guillemin group would be to encourage best practices in promoting healthy microbiome development in children, for example by encouraging breastfeeding and avoiding excessive use of antibiotics. “Antibiotics are valuable for preventing infections, but they have been viewed as causing no real collateral damage, whereas now we appreciate that there’s actually a risk associated with antibiotic use. We should be questioning whether practices make sense such as impregnating our kids’ pajamas with antimicrobials,” Guillemin said. Inside the intestine of a single larval zebrafish exists a teeming community of hundreds of thousands of bacteria. Each of these bacteria secretes hundreds of proteins into the gut. For Hampton Hill, the process of sifting through all of those proteins in search of an unknown factor played out over the course of countless experiments. But even after all those months in the lab, the moment she narrowed her list of 163 potential proteins to a single suspect was somewhat anticlimactic. The findings seemed a little too neat to be believed. Hampton Hill’s advisor, UO biologist Karen Guillemin, recalls her own skeptical response. Further testing confirmed the results and months of additional research followed. Guillemin and Hampton Hill compiled their findings in a just-published research paper in the open access journal eLife. The one protein, dubbed Beta Cell Expansion Factor A, or BefA, boosts insulin-producing cells in the pancreases of zebrafish. The bacteria that live among us and the products they release represent an underexplored resource that could someday hold the key to solving many human diseases, including Type 1 diabetes. Formerly known as juvenile diabetes, Type 1 diabetes afflicts nearly 1.5 million Americans and typically first appears at a young age. “It’s exciting to think that bacteria could play such an important role in a process that is so essential for the ability to regulate sugar metabolism,” Hampton Hill said. The research demonstrates the important developmental role of the microbiome. It also serves as an example of how research projects are carried out at major research universities like the UO, where the process of scientific discovery is built on the model of senior faculty mentors and junior graduate students working collaboratively together. When naming bacterial products, researchers stick to a convention of providing them with a three-letter moniker that designates their observed function. And much like naming a champion racehorse, they need to avoid names that have already been used. 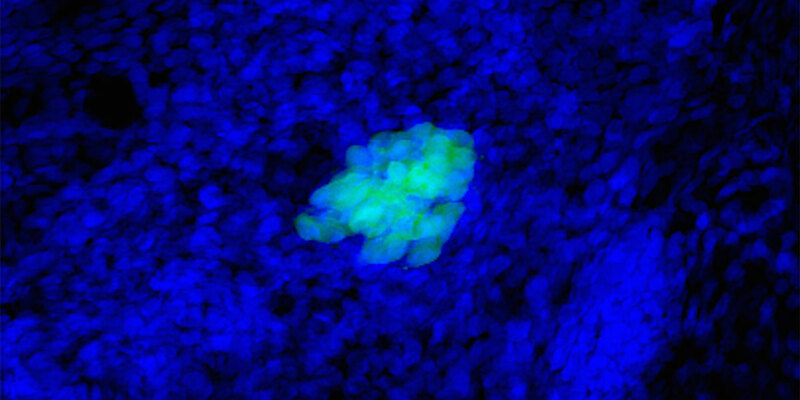 To describe their newly discovered protein that induced beta cell expansion in the pancreas of zebrafish, Jennifer Hampton Hill and Karen Guillemin chose Beta Cell Expansion Factor A, or BefA for short. As for the “A” in the title? “You have to give it the name A, B, C or 1, 2, 3, in case you discover others in the future,” Hampton Hill said. Hampton Hill, a graduate student pursuing a doctorate in biology, credits Guillemin for steering her through the project. 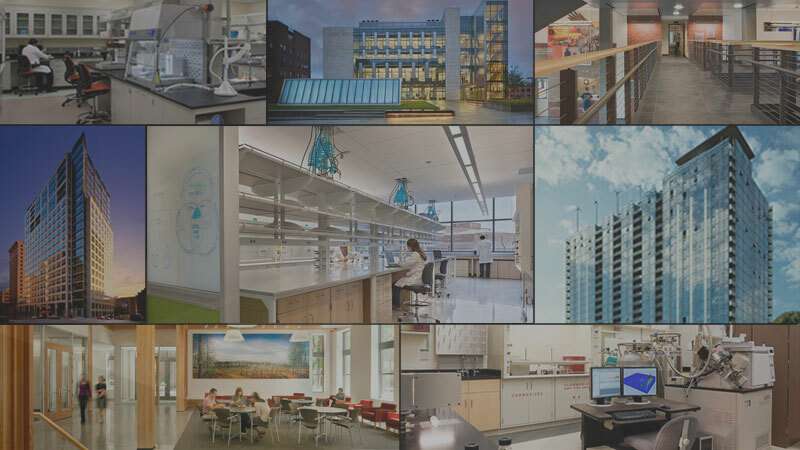 Guillemin says very few graduate students could have exhibited the kind of perseverance that Hampton Hill did during the three-and-a-half-year-long project. A professor in the UO’s Department of Biology and the Institute of Molecular Biology who also serves as director of the META Center for Systems Biology, Guillemin examines the role bacteria play in animal development and disease. She uses a research model she helped develop involving a special kind of sterile zebrafish that don’t have any internal or external microbes of their own — no microbiome, making them germ-free — so scientists can better determine the role those microbes play as animals grow. The direction of Guillemin’s work has broadened as a result of her collaboration with Hampton Hill. 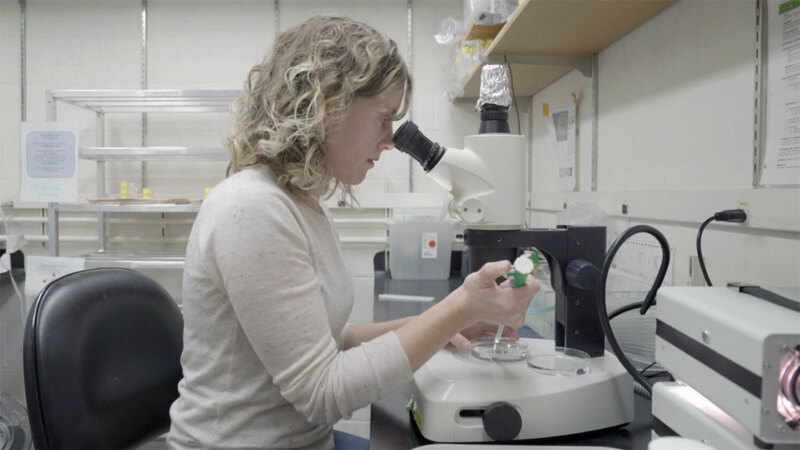 Beyond studying the impact of microbes on the guts of zebrafish, she has expanded to include other organs involved in digestion, and, she says, this current project is among the most important work she’s done to date. Hampton Hill’s interest in the pancreas began shortly after she left Humboldt State University with an undergraduate degree in cellular and molecular biology. After she completed a fellowship at the University of California San Francisco, where she learned about pancreatic development and gained experience working with zebrafish, she came to the UO in fall 2011 and joined Guillemin’s team the following spring. Having studied the pancreas and its importance to metabolism, and knowing that host metabolism can be strongly influenced by microbes, Hampton Hill naturally developed an interest in the role of bacteria in pancreatic development, which Guillemin encouraged. 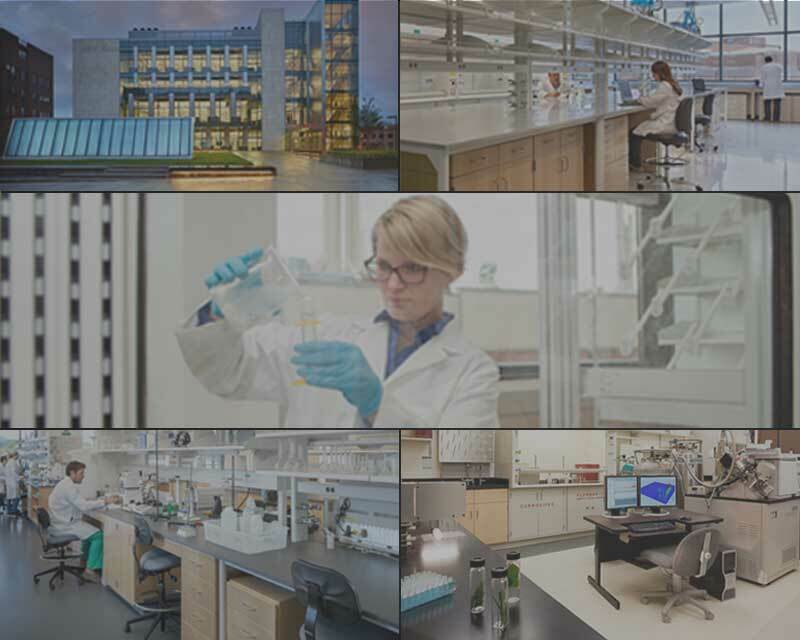 Furthering the understanding of microbial diversity and its effects on human development with the goal of developing future therapeutics for improving health and combatting diseases, such as diabetes, is the type of translational research that could eventually be conducted at the recently announced Phil and Penny Knight Campus for Accelerating Scientific Impact. “Ultimately we’d like to team up with researchers studying Type 1 diabetes to look at developing BefA-related molecules as potential therapeutics,” Guillemin said. From Guillemin’s perspective, Hampton Hill’s instincts about studying the role of bacteria in the development of the pancreas were good. Guillemin encouraged some preliminary research and Hampton Hill returned with scientific images that clearly showed many fewer insulin-producing cells were present in microbe-free zebrafish. “Once she showed me those images … I said, ‘OK, there’s something here,’” Guillemin said. Having identified the phenomenon, many students would have been happy to end their research there. But Hampton Hill was intent on discovering what the microbial factor was that was causing an expansion of beta cells, Guillemin said. Hampton-Hill and Guillemin went on an exhaustive hunt using scientific techniques spanning genetics, biochemistry and bioinformatics and even the use of mass spectrometry services at Oregon Health & Sciences University to isolate different proteins. The results continued to point to the idea that a specific factor, rather than a generic type of microbial product, was causing the phenomenon. Experiment after experiment, Hampton Hill methodically narrowed her list of suspects. Using a collection of known bacteria, she identified a few promising suspects and further reduced her list of possibilities. The microbe-free system in the Guillemin lab allowed her to study the effects of bacterial products and eventually arrive at her list of 163 proteins, which she then reduced to the single BefA protein. In the final stages of the study, Hampton Hill and Guillemin identified bacteria in humans that produce proteins that are similar to BefA. They tested these proteins in microbe-free fish and found them to be potent at boosting the number of insulin-producing cells. In addition to the exciting possibilities the project presents for additional diabetes research, the study by Hampton Hill and Guillemin provides a model that other researchers and graduate students will study and build upon with future research projects. Zebrafish embryos have since become very popular worldwide as a means of understanding how all vertebrates, including people, develop. Zebrafish eggs are transparent and develop outside of the mother's body, providing scientists with a window on development — researchers can literally watch a zebrafish egg grow into a newly formed fish under a microscope. Today, thousands of researchers around the world use zebrafish as a powerful biomedical model organism useful for understanding human health, disease and function. Currently, about 100 UO researchers in 11 laboratories use zebrafish to study medical issues and fundamental questions about how organs develop, regenerate and function, as well as questions related to interactions between zebrafish and their resident microbes.